Many interview articles start with the phrase "insert name is very busy these days." Most of the time this is false, unless you consider the life of James Franco. On the other hand, the statement rings absolutely true for Chuck Sambuchino. In addition to editing Writer’s Digest Books, including Guide to Literary Agents and Children's Writer's & Illustrator' Market, Chuck is administrator of the popular Guide to Literary Agents Blog and columnist for WriterUnboxed.com. Chuck is also a best-selling author. 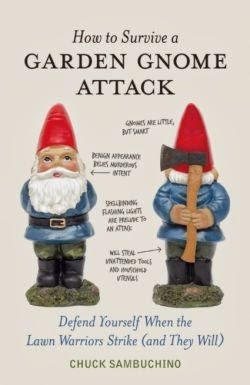 His book How to Survive a Garden Gnome Attack was optioned for a future film by Sony Pictures Animation back in 2011. On top of that, Chuck is returning as a keynote speaker to this year's Northern Colorado Writers Conference. And if that isn't enough, Chuck hunts vampires in his spare time while competing in dystopian games of death. We were able to get in touch with Chuck in-between his editing, writing, and vampire hunting in order to ask him a few questions about his career and upcoming visit to the conference. The Writing Bug: Can you begin with a brief overview about yourself and your writing/literary career? Chuck Sambuchino: I don't want to bore anyone, so I'll just give the basics. I am an editor for Writer's Digest Books. I began with WD Books about 9 years ago. I edit two annual guides -- the GUIDE TO LITERARY AGENTS and the CHILDREN'S WRITER'S & ILLUSTRATOR'S MARKET. I blog for WD and help with other imprint tasks as well. In my spare time, I'm a writer of humor books, articles, screenplays, and other stuff. If you're interested in me or my books or my freelance editing, simply check out chucksambuchino.com. TWB: How did you first hear about the Northern Colorado Writer's Conference? CS: I was invited to come speak in 2008, which seems like forever ago. I never lost touch with organizer Kerrie Flanagan, and we've chit-chatted ever since. In fact, I was so impressed by my Fort Collins visit in 2008 that my wife and I did a mini-vacation there in the summer of 2013 to hike. TWB: What is one piece of advice you give to aspiring writers? CS: Educate yourself. The more you know about craft, about creating compelling characters, about query letters, about promotion, etc., the greater chance you will succeed. Sure, there are some overnight success stories, but I would bet my money on the writer who keeps writing and never quits. TWB: What are you currently working on? CS: I am wrapping up a brand new trade book called GET A LITERARY AGENT (tentative title) coming out at the end of 2014, which compiles everything I've learned about getting an agent. It also includes the advice/quotes of 75 or so agents who share wisdom and tips for writers. I'm also hard at work on the 2015 editions of the market books, which come out in September 2014. TWB: What is the number one reason you would encourage local, aspiring authors to attend? CS: Because conferences are where it's all happening. This is where you learn about your publishing options from experienced pros. This is where you get your specific questions answered. This is where you sit down face to face with agents, editors and authors. This is where you get your batteries recharged. This is where you discover the definite next steps you need to take to continue your journey. This is where you make writing friends and meet possible critique partners. TWB: How does your work as an editor benefit your work as an author? CS: As an editor for WD Books, I am always surrounded by writing advice. This helps me constantly become a better writer and a better marketer of my work. TWB: As the keynote speaker, how do you prepare for this type of event? How do you decide your topic? CS: The best preparation is practice. And my speech is loosely called "How to Get Published". It's a collection of the best writing advice I've ever picked up over the years. Its goal is to inform, entertain, and inspire. TWB: What is your anticipation for this year's conference? CS: Great things. This an exciting time of change for the publishing industry, since we're all adapting to the rise of e-publishing and what that means for experienced writers and new ones. So conferences are responding by bringing in experts of all types to address different publishing paths and offer advice to writers. You can follow Chuck on Twitter at @ChuckSambuchino. Thanks for the interview! I'm eager to meet Chuck and learn lots from him...including whether I should be concerned that my garden gnome watches me when I sleep. Great post, Rich! And he was a great Keynote at the conference!